What would you say to a little time travel of your own today? I just had one and it felt amazing. The year is 1973. In corporate, rich and satisfied America two bored individuals are looking for a vacation spot with a kick. And oh boy do they find one. Westworld is a science fiction feature movie, written and directed by Michael Crichton, about dangers of science and techno progress. The film revolves around a simple, very basic plot, and that simplicity is exactly the reason why the story provides a very clear perspective on the matter. Notable performance of the cast and a very detailed presentation of a speculative setting make watching the 88 minutes production worthwhile and a very rewarding experience. It’s a western and it is sci fi. There’s something special about the way the movie plays on the contrast between a 1880’s American town, and a modern day laboratory, or perhaps it should be called a control room. The contrast is again very basic, very casual and non-stressing. 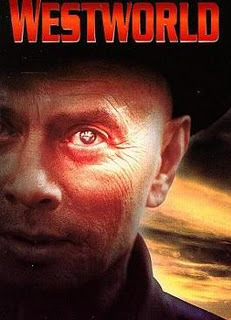 Legendary Yul Brynner here plays an android whose matrix is going berserk and makes him a danger to humans. Something goes wrong in the entire compound, digital components malfunction and people are about to rip the consequences. What price comes with enjoying high tech pleasures of a manufactured resort? Watch the film to find out. And as a side dish, enjoy the movie’s distinct and so nostalgically refined 70s flavor. Camilla’s ‘SPACE SCRAPERS’, a Sci Fi series of short stories, is coming out soon!